The following instructions will guide you through the CSR generation process on Mac OS C El Capitan (v.10.11). To learn more about CSRs and the importance of your private key, reference our Overview of Certificate Signing Request article. If you already generated the CSR and received your trusted SSL certificate, reference our SSL Installation Instructions and disregard the steps below. Launch the Mac OS El Capitan (v.10.11) Server App. 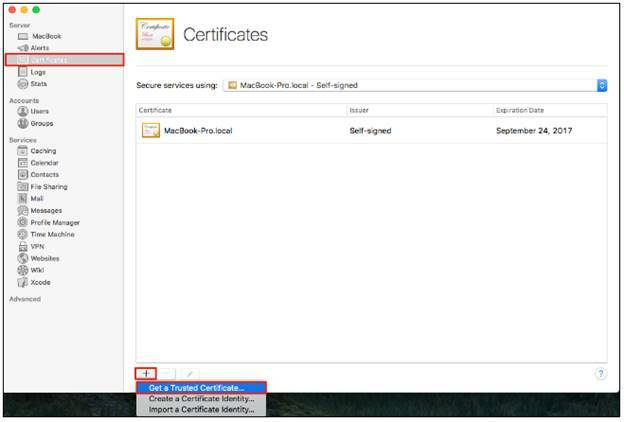 From the Server App window, under Choose a Mac, select one of the following options to determine where to create the CSR and install the SSL certificate once issued. Click Next on the Get a Trusted Certificate page. Note:To avoid common mistakes when filling out your CSR details, reference our Overview of Certificate Signing Request article. Note: Make sure you remember the filename and file path where the CSR was saved. After you complete the validation process and receive the trusted SSL Certificate from the issuing Certificate Authority (CA), proceed with the next step using our SSL Installation Instructions for Mac OS X El Capitan (v.10.11).